Ladder Sales Direct have worked very hard to put in place an efficient and reliable Free 2 - 5 Working Day Delivery service to most of the UK. (With the exception of the Warehouse and Mobile Step range and other products where notes which are manufactured to order 10-15 Working days) The cut off time for this is 4.00pm. Please note, carriers normally only deliver Monday to Friday, so an order placed on Friday for next day delivery will not be delivered until the following Monday. The delivery cut off time to receive your order the 2 - 5 Working Day is 4.00pm. We can offer a Next Working Day Delivery Service (An Extra Charge Will Apply, Next Working Day delivery is also only available On Telephone orders). We will need to have your order by 12 noon to allow us time to process your order. If our couriers cannot deliver the item because nobody is present at the address, they will leave a card. Delivery will then be attempted on two other occasions. After this point, you will need to call your local depot to arrange a more convenient delivery date. If the courier receives no contact from you after a period of approximately 10 working days (depending on the product as stated above), they will return the package to us. This may result in extra shipping costs being incurred for re-delivery. Ladder Sales Direct advises that customers who foresee difficulty in obtaining their item at a home address should state a different delivery address at checkout. If your delivery address needs to be changed after the checkout procedure, please call us on 0117 330 2277 and we will get this changed for you, however this may affect the speed of delivery. Please note, in the event that an item is sent direct from one of our suppliers to a non-mainland address, as detailed above, we will contact you after the order has been placed with a quote for delivery charges to your address. Please note as many products are shipped directly from the manufacturer, you may not receive all parts of your order in one delivery. If you are unsure about any aspect of your delivery, please contact us for further details. Please contact us before placing an order to discuss your requirements, ask any questions you may have about the products, and give us any special delivery instructions. 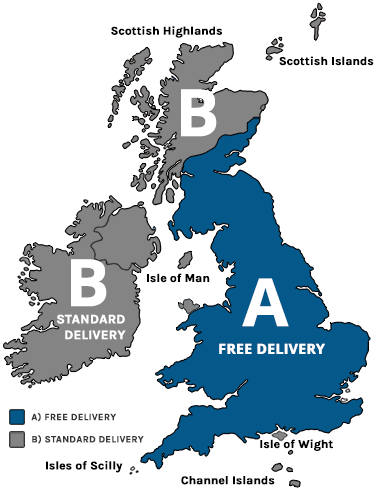 For pricing and delivery information for these regions, please call us on 0117 330 2277.